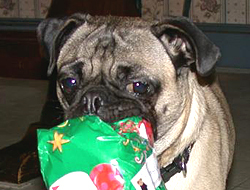 It was late July 2002 when we got the call from JoAnne, our pet and house-sitter while we were away on vacations. 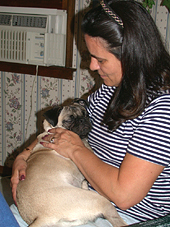 JoAnne, a friend of my daugher's mother-in-law, had been pet-sitting for us for several years. 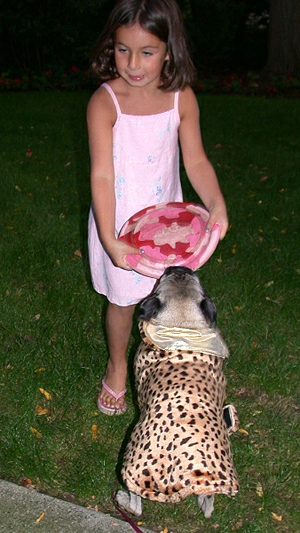 We were lucky to find her as she truly loves animals and dotes as much over everyon else's pets as her own. 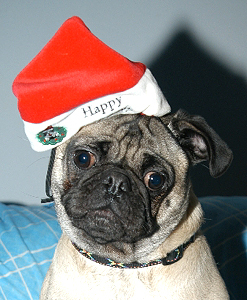 She loves Padi to death and remembers him each Christmas with a nice little packet of treats and toys. 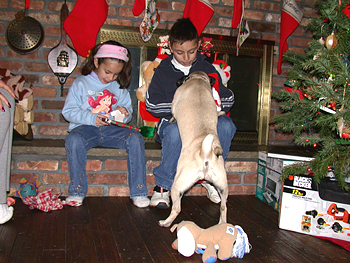 Once, at Christmas, she came by the house to take Padi to have his picture taken with Santa. She was, and is to this day, like a surrogate mother to Padi. Anyhow, about the call. It seems as though JoAnne had a friend whose daughter Ana had just graduated college and been offered admission into a PHD program in Boston. 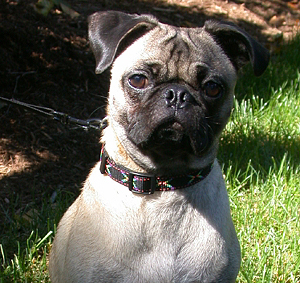 Ana, along with 11 of her college friends who shared a house bught a Pug puppy in October 2001, their senior year, naming the puppy Kaylie. When they graduated and dispersed to the four corners Ana was left with Kaylie. When the harsh realities of attending a PHD program, working, studying and her other obligations related to her schooling set in she realized she couldn't keep Kaylie. It wouldn't be fair for such a young dog to be alone so much of the time. Ana went in search of a good home for Kaylie. Her Mom told JoAnne and JoAnne immediately called us. 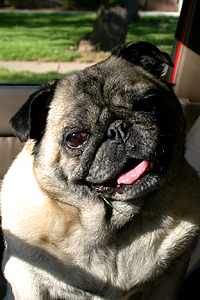 She knew that Anne and I were crazy about Pugs and I'd be willing to bet she knew before she dialed the phone that we'd be willing to take her into our home and give her the love she deserved. Kaylie wondering what I am doing! A few phone calls later it was arranged that Ana would stop by the house to "check us out" and introduce Kaylie to us. A few days later Ana and her Mother showed up at our doorstep for our first meeting. It was love at first sight. Padi, now 10 years old, had long ago lost that puppy energy and Kaylie was just overflowing with it. She was friendly and affectionate right from the start showering Anne and I with kisses. An, more importantly, seemed to get along well with Padi and the cats. school and she wanted to spend as much of that last week with Kaylie as she could. We agreed on a date and time she could drop Kaylie off the next week and off they went. I was very excited about having anohter puppy in the house. I'm not sure Anne was excited as there is always a host of problems to face when introducing puppies raised by others into the household. Kaylie would prove to be not exception. That week passed very slowly for me. I couldn't wait for Kaylie to come and live with us. Thankfully the waiting period was over and it was time for Ana to drop Kaylie off and bid her farewell. I have to admit, Anne and I were shocked. When Ana and her Mother arrived they not only brought Kaylie and her remaining food, they brought two large shopping bags full of toys, dishes and 7 or 8 "designer" coats for her. It was obvious that each of her "mothers" loved her and showered her with gifts. I'd never seen so many coats for one puppy in my life. After a tearful goodbye Ana and her Mother were off and we were finally alone with Kaylie. She didn't take long to make our home her home. She moved right in and became one of the family right away. And it wasn't long before we began to discover her personality and a few bad habits that I knew we had to change if she was going to live in this house. But the important thing is that she took to Anne, Padi and myself immediately. She showered us all with kisses and was eager to play with all of us. Especially Padi and the cats, new toys to her. Padi wondering "Why me?" thing that would have to change and, surprisingly, it didn't take long for it to change. Kaylie proved to be a smart dog who learned fairly fast. I simply taught her to badk off when I yelled the word "easy" to her when she was biting me. When she was after the cats I would yell "be nice to kitty" and she would back off them as well. So it was fairly easy to break her of her outward roughness. Mind you it didn't stop the constant attacks. I'd like to say that Kaylie settled in quickly, but I'm not sure that's the right word. She adapted easily, but she definitely wanted to rule the house, humans, cats and dogs included. So there were some trying moments those first few weeks, but we managed to make it through unscathed and none the worse for ware. Enjoy a couple pictures of Kaylie. The first few months held many surprises for Anne and I as far as Kaylie was concerned. 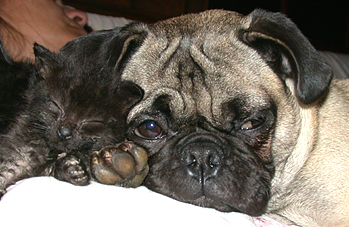 We'd owned Pugs for over 30 years and thought we knew the breed well. 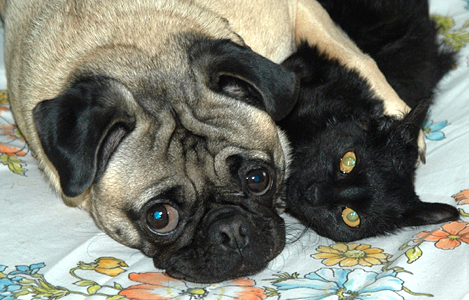 Every Pug we had, from the Puggie to Padi, were all similar in physical characteristics and their personalities, while different, were also similar. And then, along comes Kaylie. Kaylie was so different in many ways. First, she weighed in after a year at a whopping 28 pounds. When I took her to a new vet who owns 5 Pugs herself she told me that when she saw the chart and read that she weighed 28 pounds she expected to see an extremely overweight Pug. Kaylie might be a bit overweight, but she is by no means obese. She is extremely fit and muscular. She's also at least two inches taller than Padi and built very solid. So her size and build are somewhat different from the Pugs we previously had. Another striking difference is her bark. 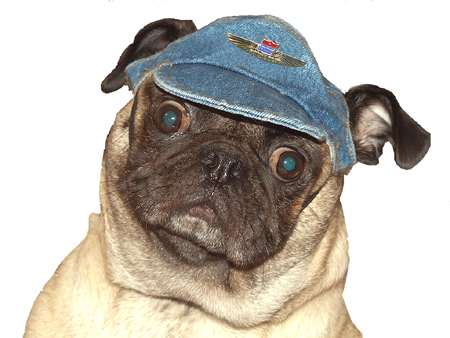 Every Pug we've had has had a very low bark, certainly not an ear piercing bark. Kaylie, unfortunately, has an ear piercing bark. To make matters worse she exercises her bark often. I think she has a philosophy of "if it moves I need to bark at it." The worst is when we ride in my 4-Runner. She stands in the backseat with her front paws on the armrest between Anne and I. When she sees something she lets out one those ear piercing barks, ofen totally unexpected by Anne and myself. It really goes through you and leaves your ears ringing for a few minutes. Anne is always yelling at her for barking in her ear. Maybe we will get lucky one day and her bark will go down a couple of octaves. 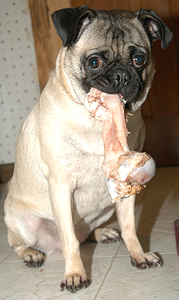 Now, the next major difference between Kaylie and all the other Pugs we've had deals with eating. 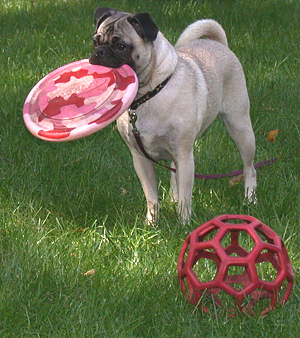 If you've ever had a Pug or been exposed to one, you know that their favorite thing to do in life is eat, eat, eat. They love food and would eat to the point of exploding if you let them. Kaylie is no different. She's starving from the minute she awakens until the minute she goes to sleep. Heck, she's starving after just finishing dinner. Not that doesn't surprise me. Every Pug I've had has been that way. What does surprise me is that she eats anything. And I mean anything. Leave a napkin or tissue unattended on the coffee table ... gone. If it hit the floor ... gone. She will chew anything up and try to eat it. We have to be extremely careful that she doesn't get her hands on something dangerous. Around there that's difficult. If you leave something on a counter, well out of Kaylie's reach, that sitll doesn't solve the problem. Twerpe, our youngest kitten now 2, plays with it and it eventually ends up on the floor. It's a challenge just to make sure she doesn't get something bad for her to eat. But, thank goodness, we've been lucky so far. We've lost money, ear rings, cigarettes and lots of other things, but they all managed to come out he other end safely. Kaylie and Twerpe enjoying a hug. Kaylie has been with us three years now (I was slow adding this page) and she has certainly endeared herself to us. I don't know what we'd do without her. She adds so much life and spontnaiety to our lives and our home.